Beezie Madden and Simon. Photo courtesy of Noelle Floyd. The EQUUS Foundation is pleased to announce that Ariat has signed on for the third year as a corporate partner and has taken on an expanded role as a team sponsor of the EQUUS Foundation Fete Cheval Etoile which will be held on Friday, February 20, 2015 in Wellington, Florida. Ariat will be sharing the spotlight with Animal Planet during the evening of February 20th in recognition of their mutual commitment to horse welfare. 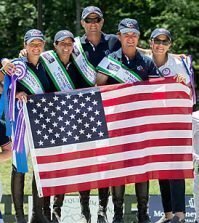 Beezie Madden will captain the Ariat/Animal Planet team of Georgina Bloomberg and Nicole Shahanian-Simpson. 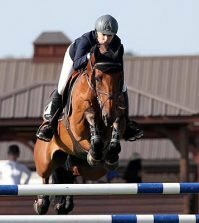 George Morris and Katie Prudent will judge Madden, Bloomberg and Simpson in the Best Performance Team Invitational, a first of its kind competition where teams of grand prix riders will compete over a 1.35m jumper course judged on style and performance. Tables and Individual Seating are available. Click here to RSVP online! “EQUUS Foundation does such amazing work for both people and horses. We are thrilled to continue our partnership and look forward to an incredible year ahead,” said Susan Alcala, vice president of partnership marketing at Ariat International. Ariat will continue to support a variety of initiatives including the Champions program, one of the Foundation’s main initiatives, an incentive-based equine service program created to stimulate volunteerism within the equine community. “Thanks to Ariat’s partnership, dedicated volunteers participating in the Champions program are eligible to eligible to win a grant for their favorite equine charity, apply for academic and riding scholarships and receive gift certificates for Ariat products,” said Lynn Coakley, EQUUS Foundation President. 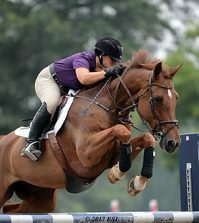 Ariat will be also be one of the sponsors for the Foundation’s Benefit Luncheon on June 20, 2015, held in association with the Fairfield Grand Prix, the culminating event of the Fairfield County Hunt Club June Benefit Horse Show in Westport, Connecticut. Ariat International, Inc. is the leading manufacturer of innovative performance equestrian footwear, apparel and belts. Featuring a patented technology designed to deliver stability, durability and comfort, Ariat pioneered the application of advanced athletic shoe technology into English riding boots and authentic Western boots. Ariat products are sold in a network of retail outlets throughout the world. For more information about Ariat products or for the Ariat retailer nearest you, contact Ariat at 800.899.8141 or visit www.ariat.com.